Cochlear implantation is a standard treatment for children with severe-to-profound sensorineural hearing loss. Since the introduction of CI more than 30 years ago, considerable progress has been made, and the eligibility criteria have been expanded repeatedly. However, children with inner ear malformations (IEMs) and/or cochlear nerve deficiency (CND) are still regarded as difficult candidates because the inner ear is the site in which cochlear implant electrodes are positioned and the cochlear nerve is the target of electrical stimulation by the cochlear implant. This review article, which presents the outcomes of CI performed in children with CND and/or IEMs, shows that they can be favorable candidates for CI. 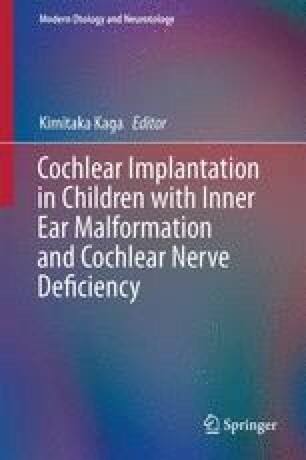 In children with CND, meticulous assessment of the status of the cochlear nerve using high-resolution magnetic resonance imaging and electrical auditory brainstem response can help to identify the optimal candidates for CI and to decide whether to proceed with auditory brainstem implant. If a child with IEM is young and has a competent eighth cranial nerve, a favorable speech perception outcome of CI can be expected.